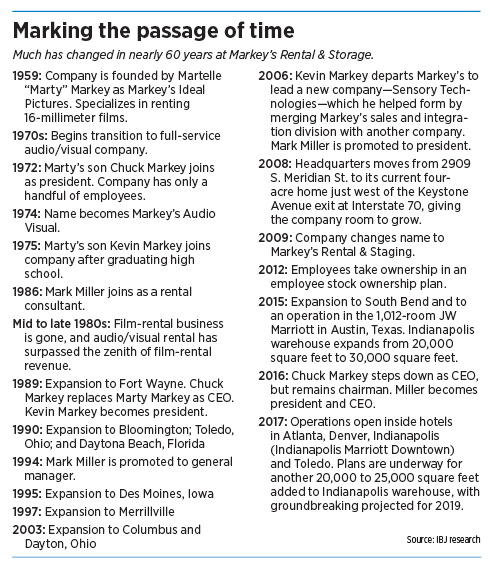 Almost everything about Markey’s Rental & Staging—the name, the focus of the business and the ownership—has changed since it was founded in 1959. But one thing (with one exception) has not. In 57 of its 58 years, the Indianapolis company has experienced year-over-year revenue increases. Only the Great Recession, in 2009, derailed Markey’s amazing streak. Markey’s provides lighting, sound systems, projection, video production and event staging for conventions, corporate meetings, town halls, galas and award presentations. Its current leadership credits success to the foundation laid by Markey’s founder Martelle “Marty” Markey and her son, Chuck, who led the firm through a period of great change. Extreme customer service, a knack for adapting and evolving, and breeding a culture of cooperation among the firm’s employees have seen Markey’s through the types of changes that would—and have—killed many companies, industry experts said. And it appears Markey’s is well on its way to establishing another long winning streak. For the last eight years, the company has produced year-over-year revenue increases near or slightly above 10 percent. And there’s no sign that trend is slowing. In 2015, Markey’s expanded its warehouse near Keystone Avenue and Interstate 70 by 50 percent to 30,000 square feet. The company is planning to break ground next year on another 20,000- to 25,000-square-foot expansion, to open in 2020. And Markey’s is not expanding only here. Last year, it opened operations in Atlanta, Denver and Toledo, Ohio. In 2015, it opened an outpost in Austin, Texas. Because business in Texas is so strong, the company is building a 2,500-square-foot warehouse there that’s slated to open Feb. 22. Markey’s revenue in 2017 was up 9 percent, to $34 million, according to company officials. Half of that is generated outside central Indiana. Its employee count has grown to 230 full time, 150 of which are in Indianapolis. The company also works with more than 180 freelance technicians on a regular basis. Annual growth rate for the company is typically 8 percent to 12 percent, Miller added. The company has intentionally tapped the brakes on growth. Mecum, which conducts car and motorcycle auctions nationwide, has been doing business with Markey’s since 2004. A big part of Markey’s success is its ability to predict trends in an ever-shifting industry of on-stage productions. Probably more so than Gerdes realizes. Marty Markey launched Markey’s as Markey’s Ideal Pictures, specializing in renting 16-millimeter films—mostly to schools. It wasn’t long before customers were asking for movie projectors. Then screens and overhead projectors. Marty and her son, Chuck, who joined the company as president in 1972, expanded the business to meet those demands. As the industry began to rapidly evolve, so did Markey’s. It changed its name to Markey’s Audio Visual in 1974 as it morphed into a full-service audio/visual company. By the late 1980s, Markey’s had ceased renting films, but the audio/visual business had surpassed the peak of film rental revenue, said Miller, who joined the company as a rental consultant in 1986 and was promoted to general manager in 1994 and president in 2006. Miller took on the CEO role when Chuck Markey, now 71, stepped away from his full-time duties in 2016. As time went by, Markey’s became much more than an equipment-rental company. The company’s footprint expansion beyond central Indiana started modestly in 1989 with work in Fort Wayne. In 2009, the company changed its moniker again, to Markey’s Rental & Staging, partly to reflect the changing company and partly to impress clients and potential clients in big markets. Miller knew firsthand what it meant to put on a show. “I grew up in the theater,” the 59-year-old said with a broad smile. In some ways, what Markey’s does with corporate theater is much different from theatrical productions, Miller said. But there’s one big similarity. Both deal with live productions—and things can go awry. “When you’re doing something in real time, there’s always an opportunity for something to go wrong,” said Kerri Begley, vice president of business, education and events for the Indiana Chamber of Commerce. Many people who have been to a Markey’s production might not have known it. More than 13,000 people who heard Michelle Obama speak on Feb. 13 at Bankers Life Fieldhouse witnessed a project that had Markey’s fingerprints all over it. Markey’s handled all the technology for the event—which was presented by the Women’s Fund of Central Indiana—including the projection, lighting, audio, staging and decor, as well as the video and live feed that was sent to media outlets. But shaping productions that spotlight big-name speakers is nothing new for Markey’s. The firm has worked at events featuring six U.S. presidents, as well as Margaret Thatcher, Diana Ross, Bob Costas, Walter Cronkite and Tom Brokaw, to name just a few. The company’s corporate client list reads like a who’s who—names like Eli Lilly and Co., Roche Diagnostics, Delta Faucet, White Lodging (JW Marriott), NCAA, Mecum Auctions, American Legion, Finish Line, Rolls-Royce, Herff Jones, Indiana Chamber of Commerce, Indianapolis Motor Speedway, Indianapolis Zoo, The Children’s Museum of Indianapolis and Kiwanis International. In addition to taking its shows on the road, Markey's provides in-house services for hotels, convention centers and corporate customers managing daily audio/visual event technology needs. Markey’s, which handles scads of work at the Indiana Convention Center, has been a key part of attracting convention and corporate meeting business to the city, said Visit Indy Vice President Chris Gahl. Markey’s has employees camped full time at a number of businesses and hotels, including the JW Marriott and the Indianapolis Marriott Downtown and NCAA headquarters. For a hotel, having a quality audio/visual company is “invaluable,” said JW Marriott’s Ray. He said event production accounts for about 6 percent of JW Marriott’s revenue. In addition to its adaptive abilities, Miller said, two key factors are responsible for Markey’s success. First, he said, is the culture of the firm, which has been employee-owned since 2012. Along those lines, the headquarters expansion planned for next year is as much about creating more space for planning and collaboration as it is about adding storage space. The second component of success is the company’s practice of reinvesting 15 percent of annual rental revenue back into the company, Miller said, which nets about $4.5 million of annual reinvestment. “That’s unheard of in this industry,” he said. It also means the company has little debt. That practice has an unmistakable impact, Locklear said. Miller proudly points out a large, rather complicated-looking projector that sits in the lobby of Markey’s headquarters. It’s a dinosaur now, but when it was purchased in 1981, it was high-tech—and expensive. And the only one of its kind in Indiana and surrounding states. But Markey’s is not out buying every new gizmo that hits the market, its clients say. “They’re always recommending new things to us,” said Mecum Auctions’ Gerdes. “But they don’t bite on every piece of new, whiz-bang gadgetry out there.